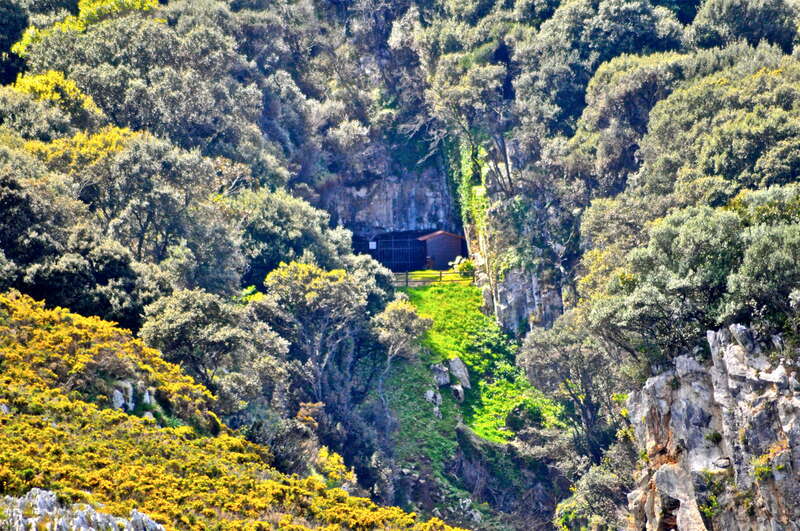 View to the sea from Cueva del Pindal. 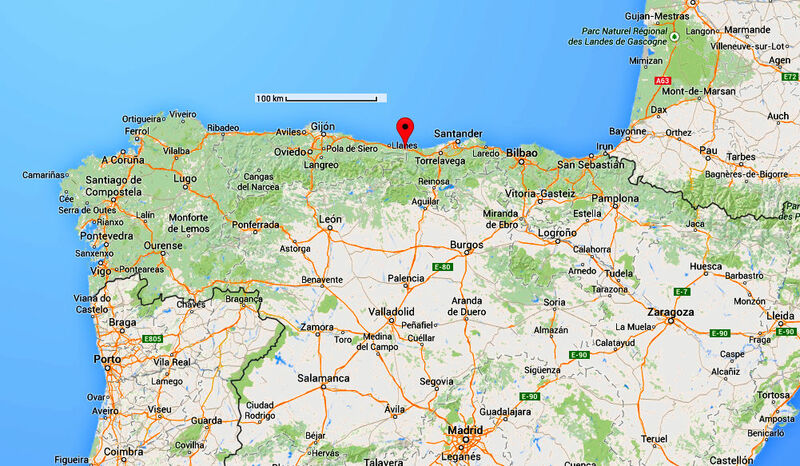 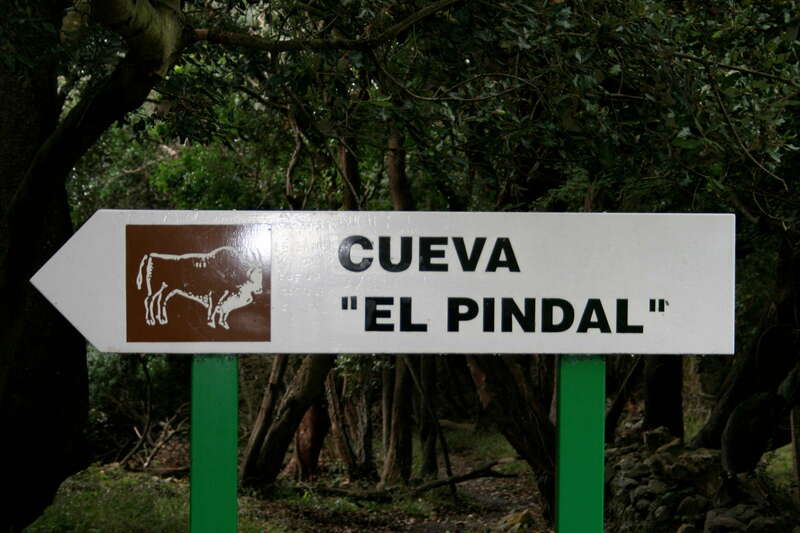 Cueva del Pindal is situated near the town of Pimiango near the border of Cantabria. 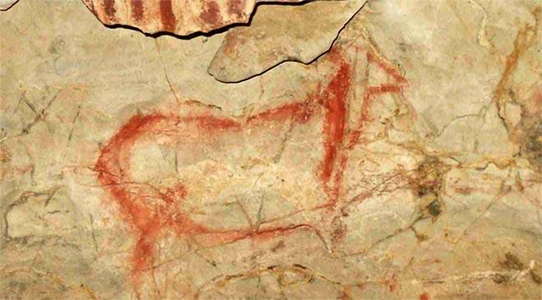 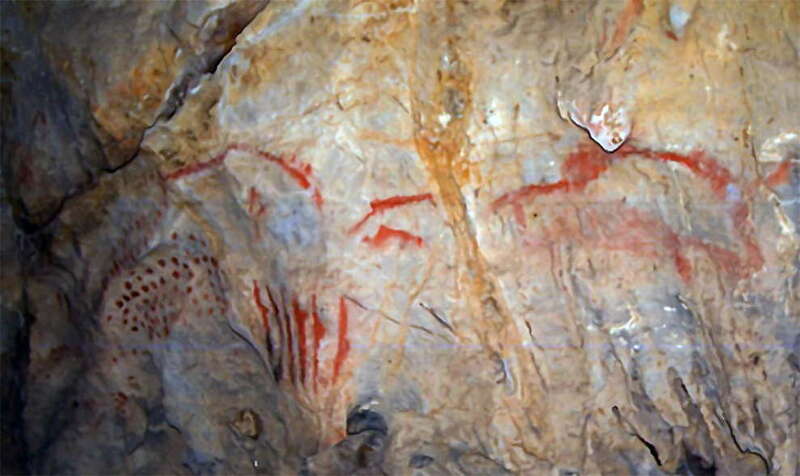 The cave paintings were discovered in 1908 . 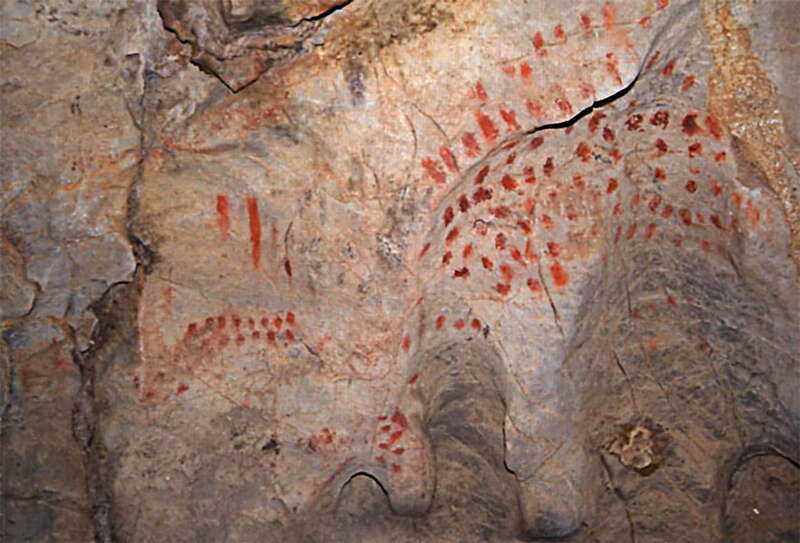 Most of the cave paintings are located on the right walls of the cave as the visitor enters. Various studies have confirmed the existence of 13 bison, 8 horses, a deer, deer antlers, a mammoth and other unrecognisable figures. There are also abundant red marks such as dots, lines, parallel lines and claviform figures. 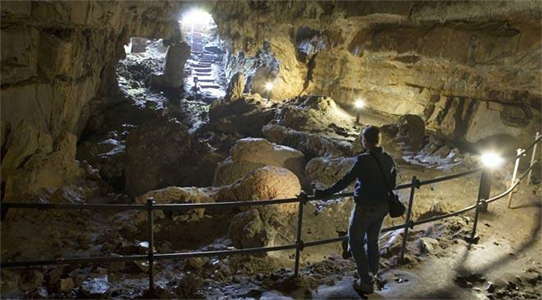 The cave is open to the public throughout the year, closed Monday and Tuesday, and Wednesday visits are free. An excellent photo of Cueva del Pindal from a vantage point some distance away, showing the position of its entranceway in the corner of a steep cliff face. 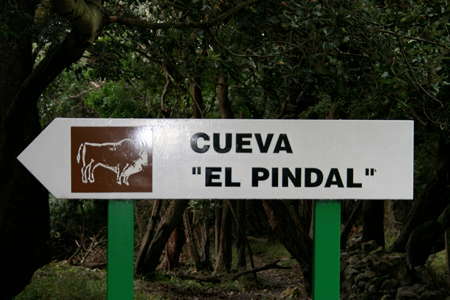 Location of Cueva del Pindal. Cueva del Pindal from above. 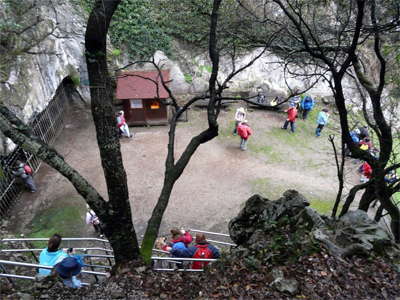 Cueva del Pindal Tourist Office. This outline of a mammoth is the same as the famous one deep in the cave which has what looks like a heart painted on it. The sculpture is similar to that erected outside Rouffignac Cave in France. 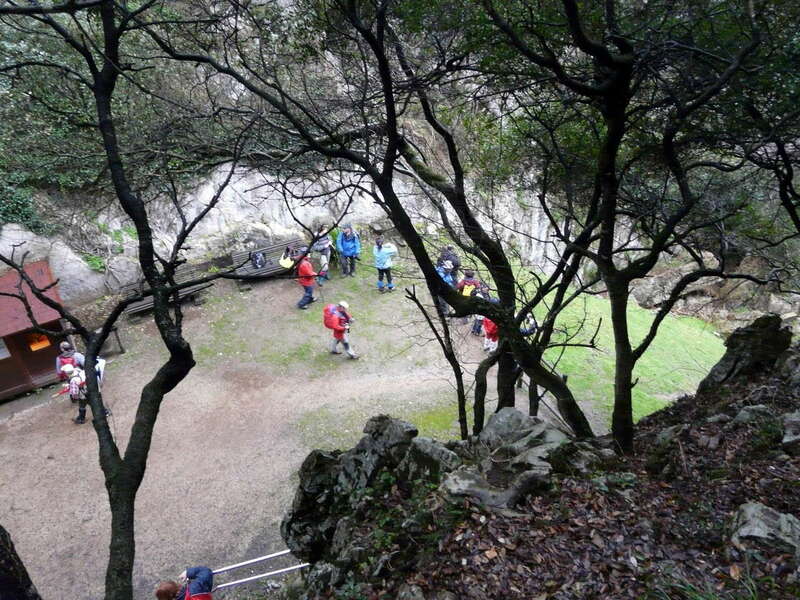 From the information kiosk, the track to Cueva del Pindal passes along a treed limestone escarpment. 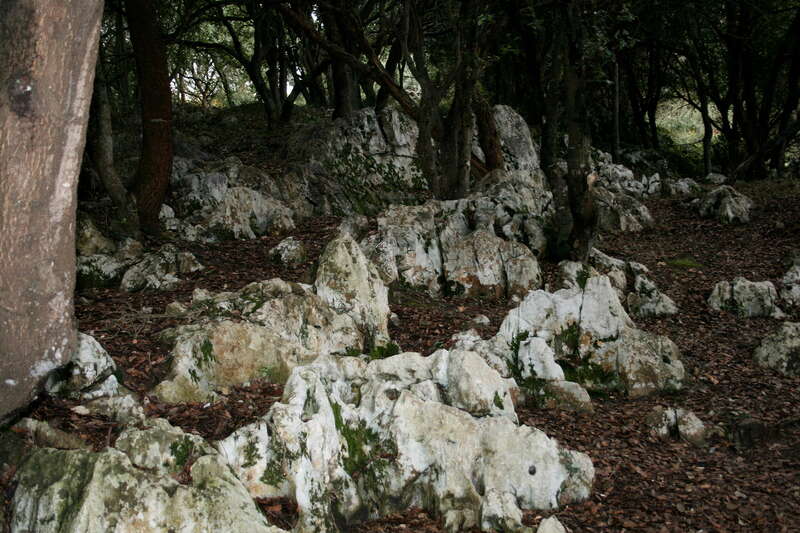 The track through the forest has many outcrops of the limestone of which the cave and the whole area is composed. Eventually the track descends down this staircase to the flat area in front of the cave entrance. 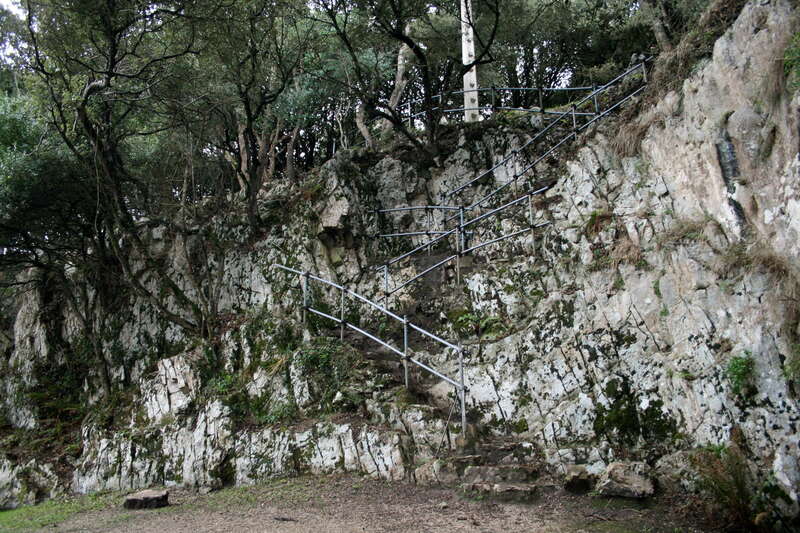 Most of the safety railings beside the track are constructed in this way. 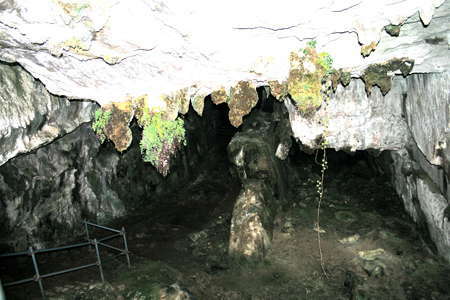 Cueva del Pindal from the top of the staircase, showing the small flat area in front of the cave, with the sea to the right. Looking the other way across the flat area in front of the cave, we can see the vista that the original inhabitants saw - although at that time the sea was a few kilometres further away, since during the ice ages, sea level dropped by about 120 metres because of all the water locked up in snow and ice at the poles. 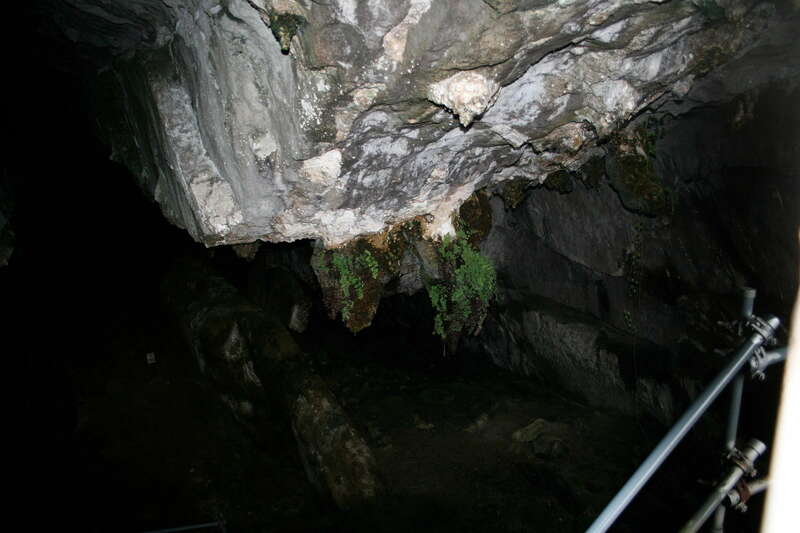 The cave was not open to tourists at the time of Ms Hailstone's visit, and these photos were taken through the bars of the entrance. 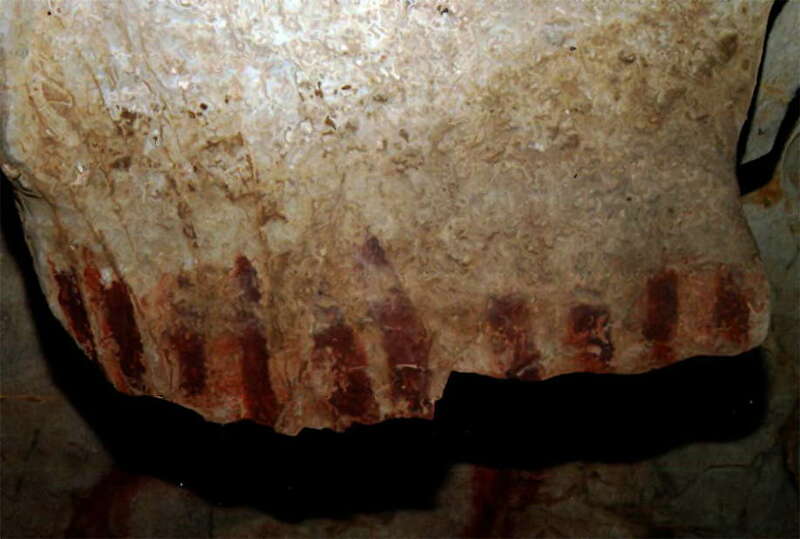 The bars provide good ventilation to ensure the conditions inside the cave remain as close to historical levels as possible, with minimal deterioration of the paintings and walls. 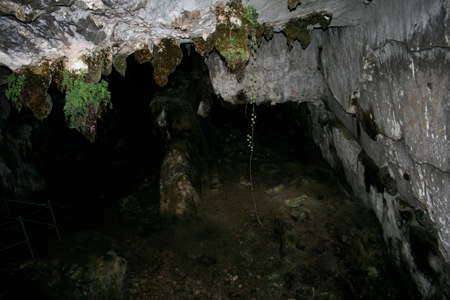 From the entrance, the path descends to the cave floor. 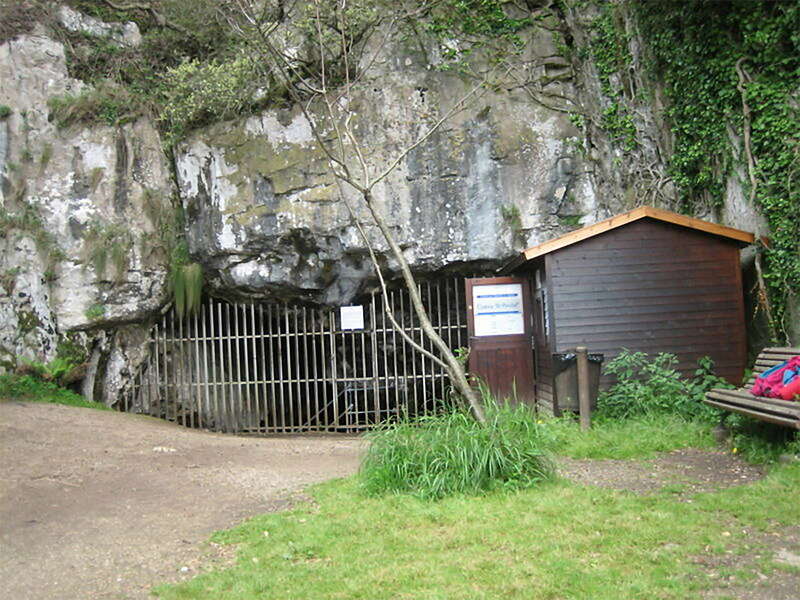 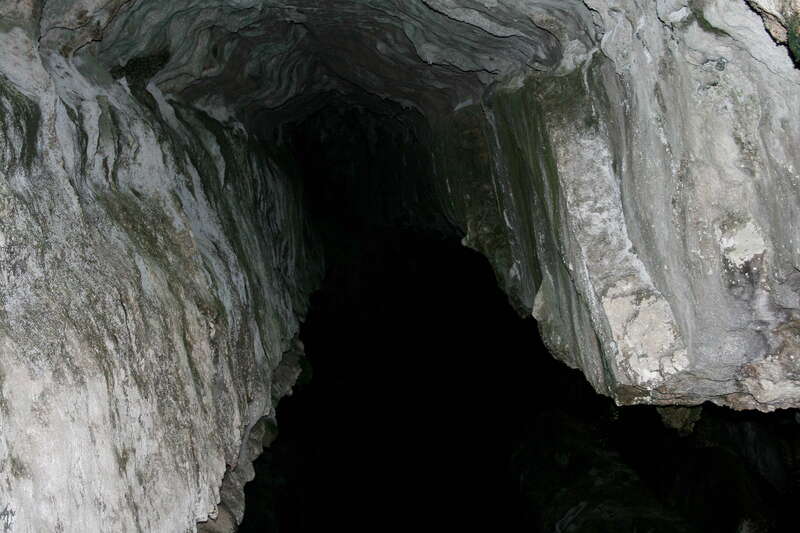 The cave is approximately 300 metres long. It is only at the entrance that there is enough light to support ferns and other similar vegetation adapted to high moisture levels and low light. Further inside the Cueva del Pindal we can see the general undulating and rough nature of much of the cave floor. 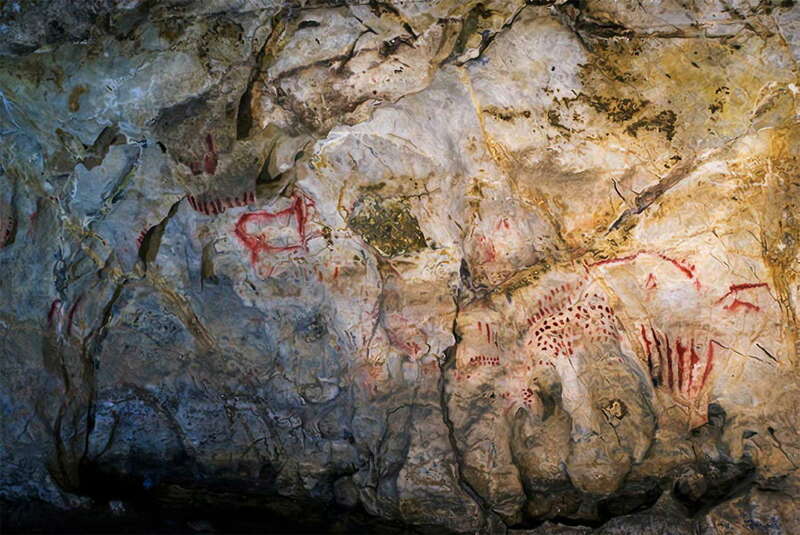 Cueva del Pindal plan, and indication of the positions of the art works. 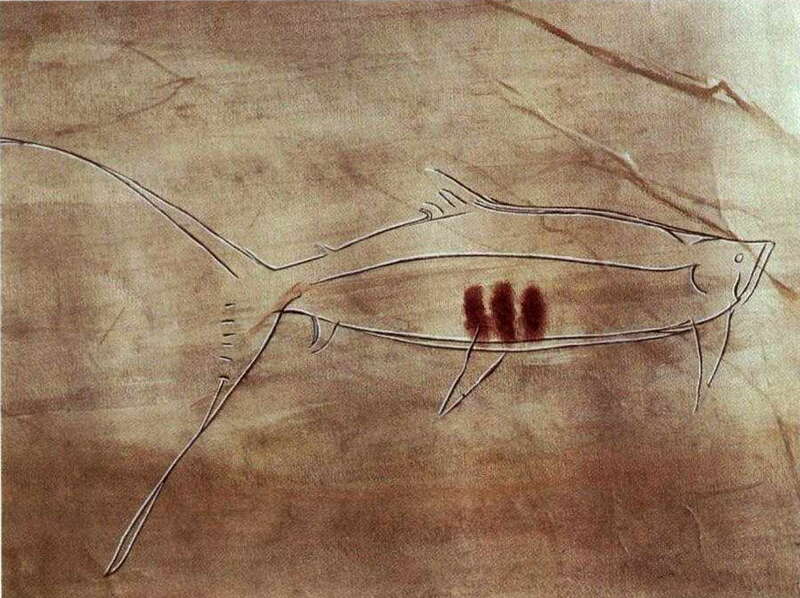 Engraving showing a fish with three red spots inside. Bahn et al. (1997) say that it has the fins and tail of a tuna, and the body of a salmonid (salmon or trout). (the tail appears to be of a deep sea fish to me, the closest I can come to identifying it is some sort of Atlantic Tuna. However, there are coastal tunas, Euthynnus sp. 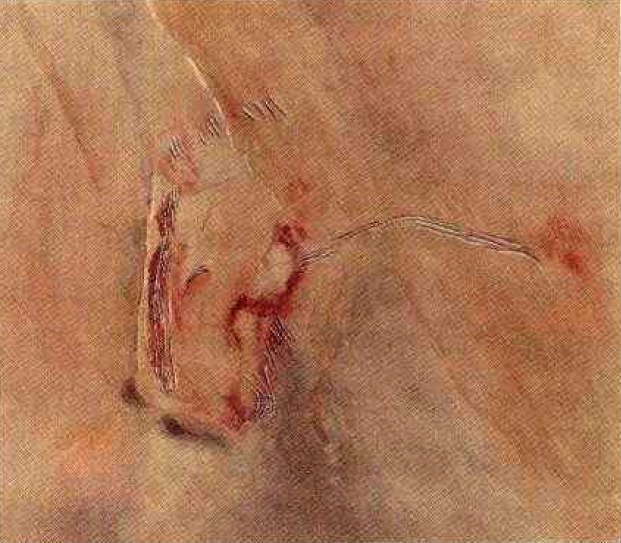 (below) an Atlantic salmon Salmo salar. Photo: (above) Robbie Cada, public domain. 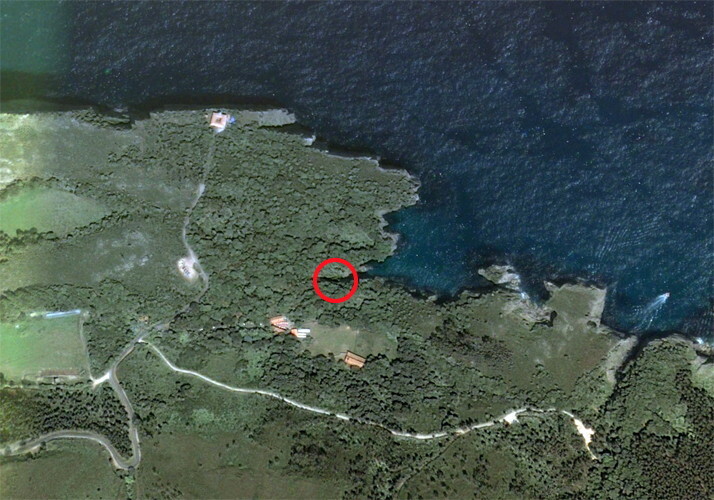 Photo: (below) Iduns kokbok, public domain. Red signs at the panel containing the engraved fish. Hind and red marks at Cueva del Pindal. Horse head engraved and painted in red. 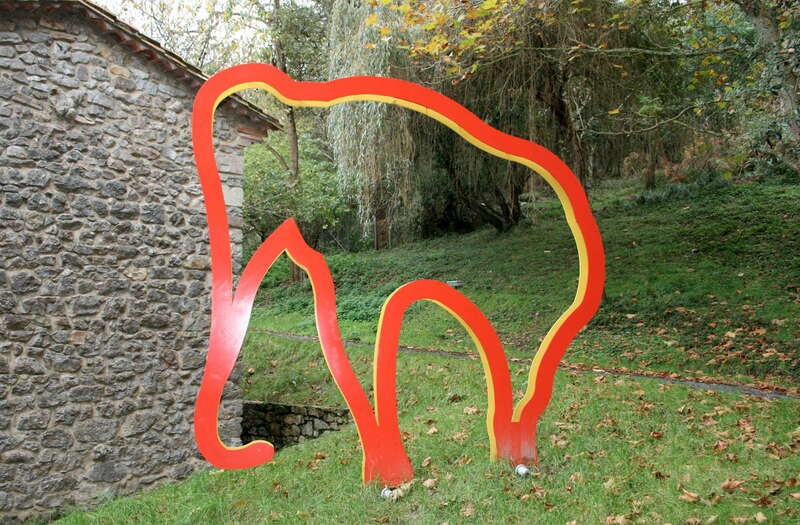 Two enigmatic signs, one a branch shape, the other looking like a railway track! A photo of the ladder or track shape. 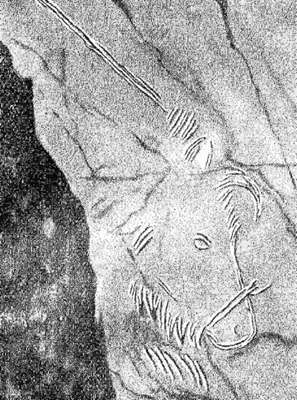 Cueva del Pindal representation of a hind. 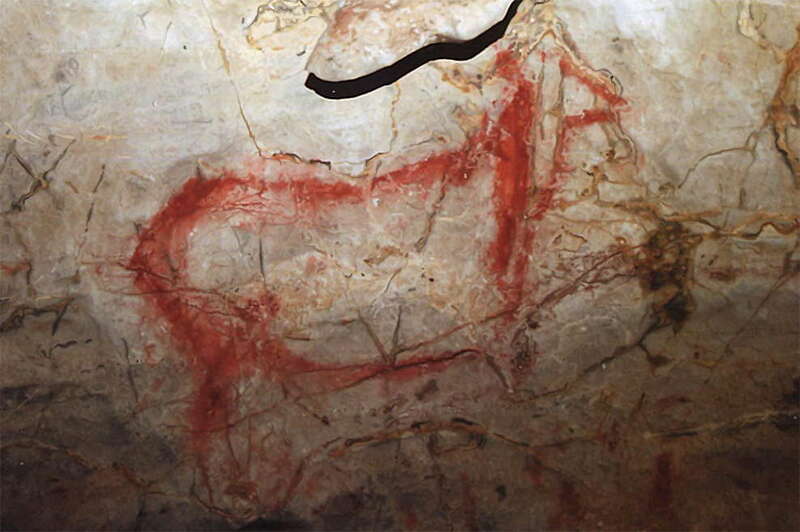 Red hind, another version. 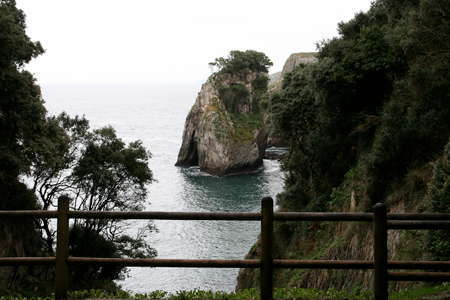 Note that the red stripes on an overhanging rock are out of frame in this view. Red stripes on a rock which overhangs the image of the red hind. Main panel at Cueva del Pindal. 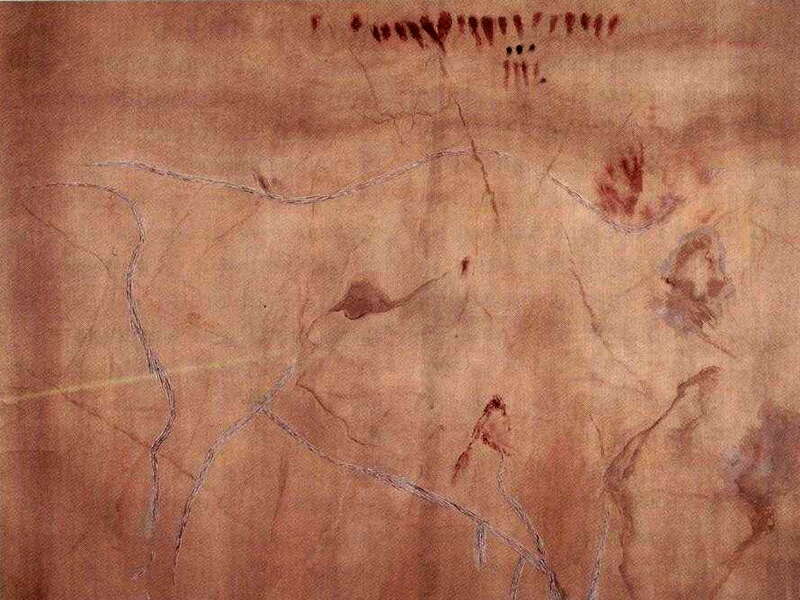 Dots, claviform (club shaped) signs, bison and horse on the main panel. Claviform (club shaped) signs. 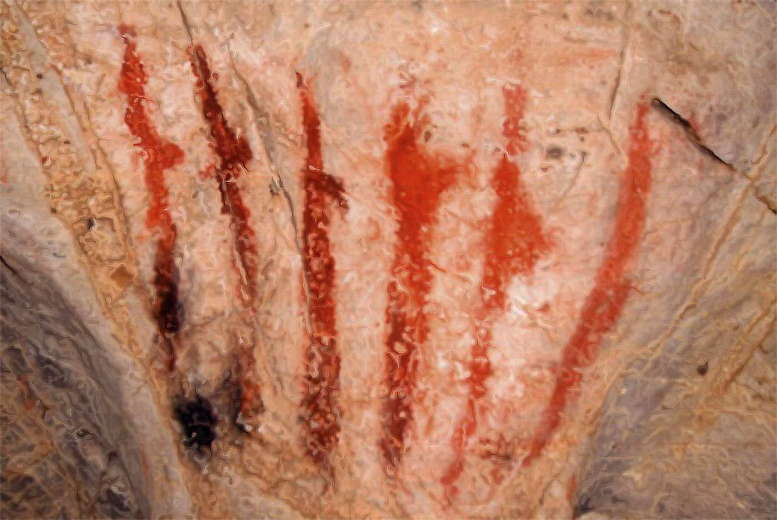 These signs occur in many painted caves, and their meaning is unknown. 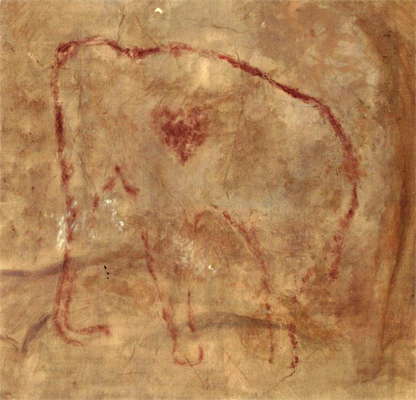 Mammoth with a red patch at the shoulder. Mammoth from El Pindal sketched by Abbé Breuil, who wrote the first book on the cave. 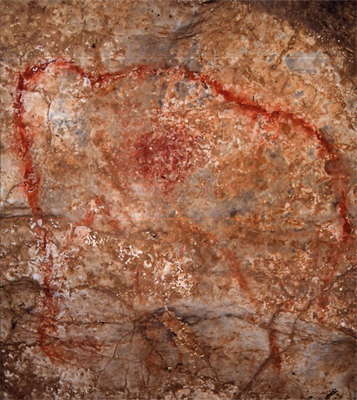 Large size engraving of a bison, with what appears to be an axe painted in red at the right shoulder. 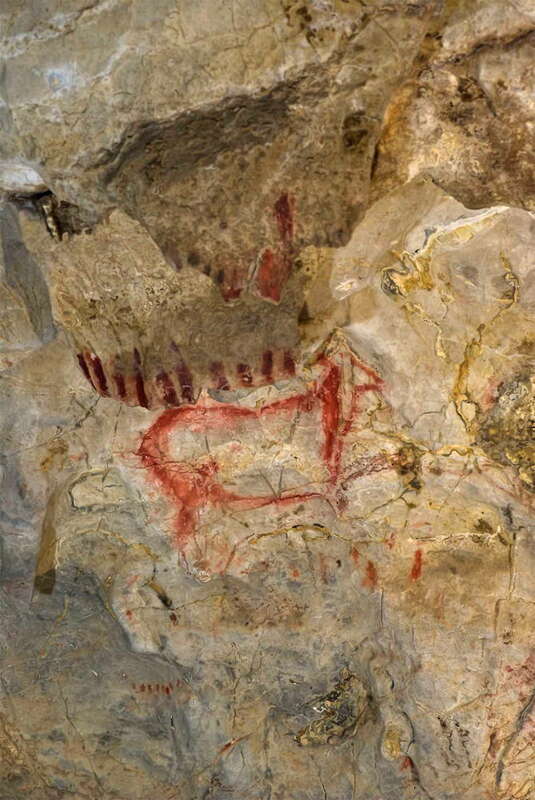 Red claviforms (paintings shaped like a club) and dots at Cueva del Pindal. 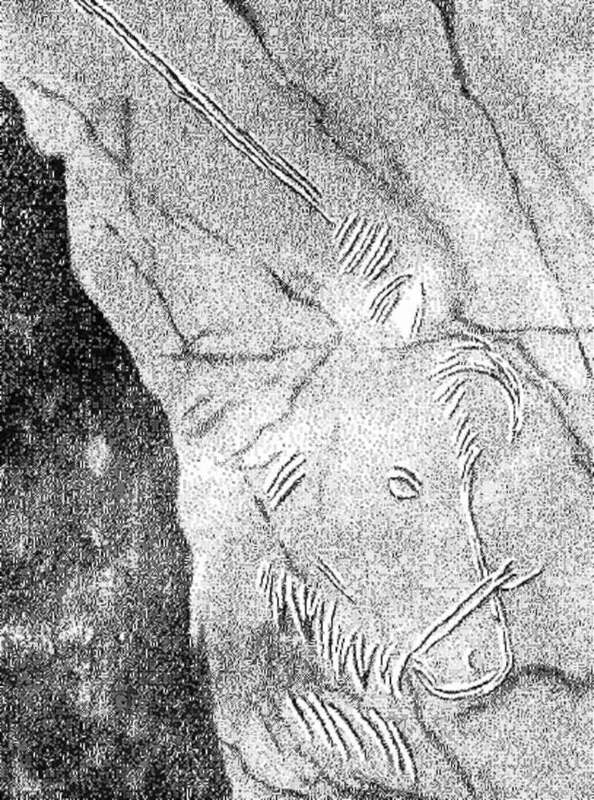 Engraved horse head at the main panel with what appears to be either a halter or some binding on the muzzle of the horse. 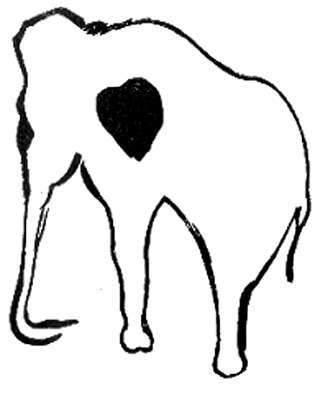 Note also that this is an illustration from a book, but no source is given. 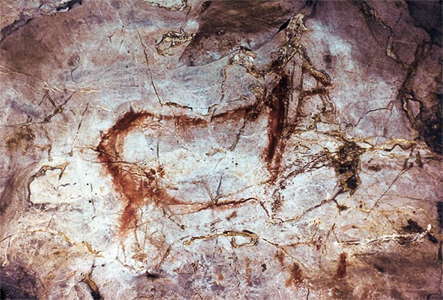 Painting in black showing two bucks and engravings of two horses. 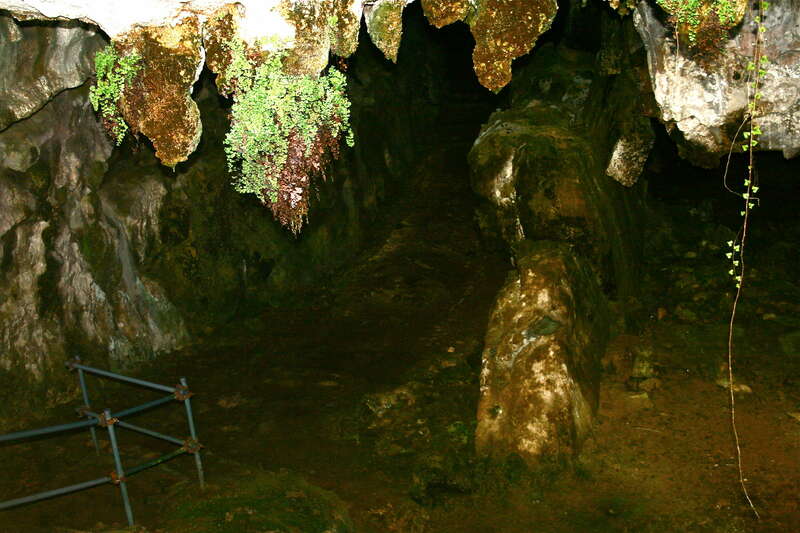 Red sign at the start of the main panel in the cave. Bahn, P., Vertut, J., 1997: Journey Through the Ice Age, London, 1997. 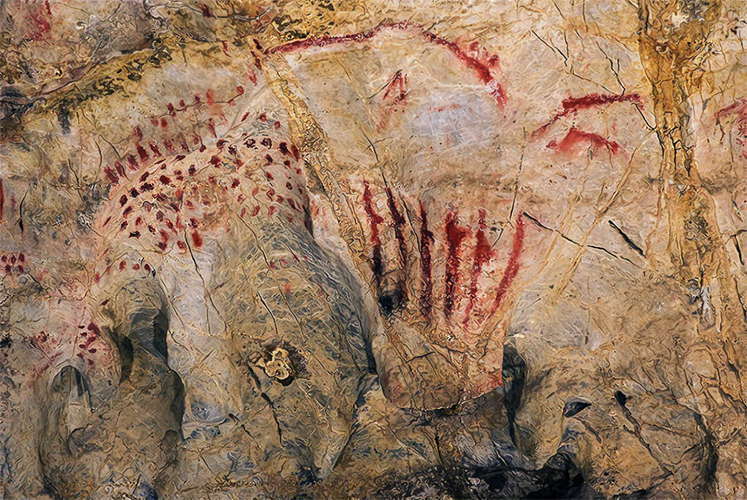 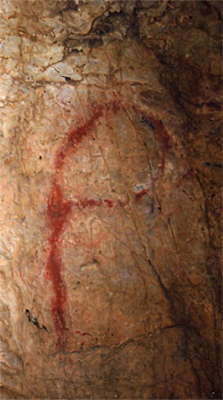 Berenguer, M., 1994: Prehistoric cave art in Northern Spain, Asturias,Cuidad de Mexico: Frente de Afirmacion Hispanista. 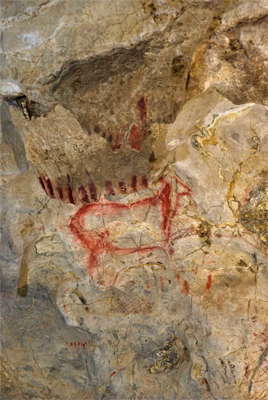 Pumariega, M., 2011: La cueva de El Pindal 1911-2011, Estudio de su arte rupestre cien años después de Les cavernes de la région cantabrique, Ménsula Ediciones, SL 1ª edición, Pola de Siero, 2011. 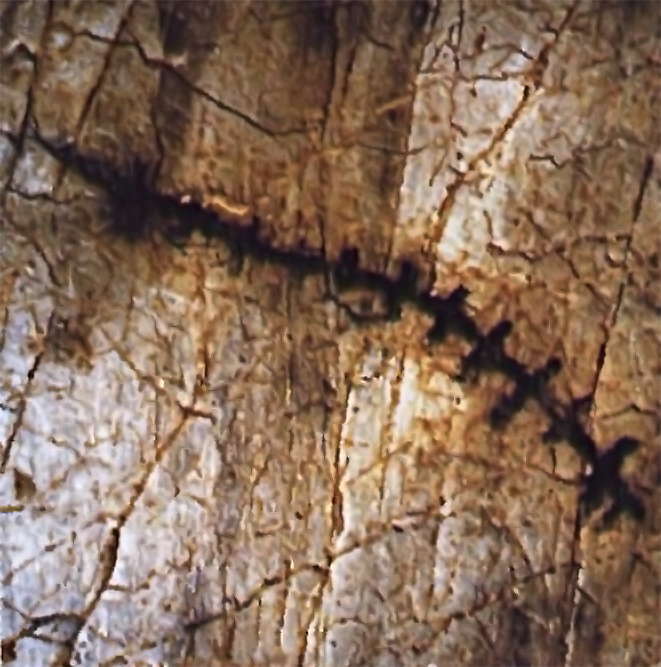 212 p.